Have you ever wondered how much money the really big tech companies are making? We have, so we looked at the money earned by 15 large, well-known tech companies to find out: Adobe, Amazon, Apple, Baidu, Cisco, Dell, eBay, Google, HP, IBM, Intel, Microsoft, Oracle, Sun and Yahoo. And because we couldn’t help but make this a bit of a competition, we picked a “winner” in each category. So, who will it be? How much money are these companies pulling in? 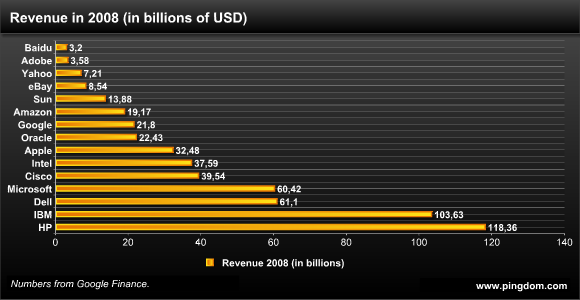 Here is the revenue for these 15 tech companies during 2008. As you can see, HP and IBM are in a league of their own here, distantly followed by Dell and Microsoft. We were quite surprised that Intel wasn’t higher on this list. While having a huge revenue is great, profit is what really counts in the long term. Profit, or net income, is the money that’s left after subtracting costs and expenses from the total revenue. 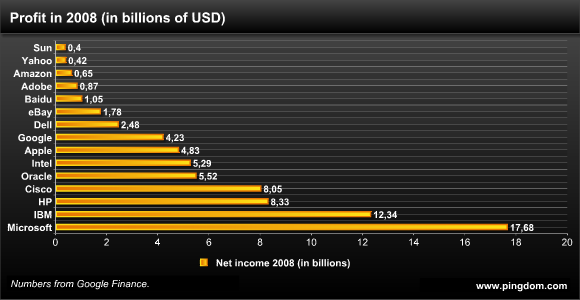 Here is the profit of these companies during 2008. Note how different this list is from the revenue one, especially for one company: Microsoft. It has by far the highest profit of these companies. 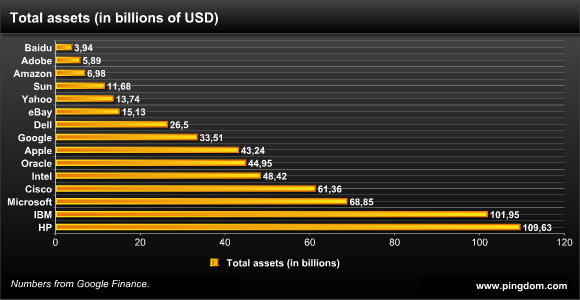 The total assets shown here include everything of value owned by these companies. Just as with revenue, HP and IBM are in a league of their own here. Microsoft and Cisco are distant seconds. We’re not saying that this is a complete view of the financial situation of these companies (we’re definitely not accountants or financial analysts) but it’s still interesting to compare these numbers to get a feel for the kind of money that big tech companies are pushing around. You might also want to check out our follow-up post about how many employees these companies have. Wow. Many of my assumptions about these companies were very wrong. I’m surprised to see that Google and Amazon is so low, comparatively speaking. Also surprised to see that Apple is even on the list. Ebay took in more profit than Adobe and Amazon combined!? Amazing. You forgot EMC! Also, Yahoo!, Google and Ebay aren’t really technology companies. They are advertising or sales companies that happen to be on the web. the numbers for 2009 will be interesting. For example Microsoft’s last reported quarter (Apr 09) showed that it’s profit is down 32% that is 2.98 billion down from 4.39 billion from year ago quarter. Msft. fiscal year ends in June I believe.